The author charging hard on this historic bike. These days we hear a lot about companies that are “disruptive.” They reimagine and reinvent how things have been traditionally done. Companies like Uber, Amazon, and Tesla come to mind. Going back 30 years ago, the cycling industry experienced a period of disruption as well. In 1986, things were a lot different from now. 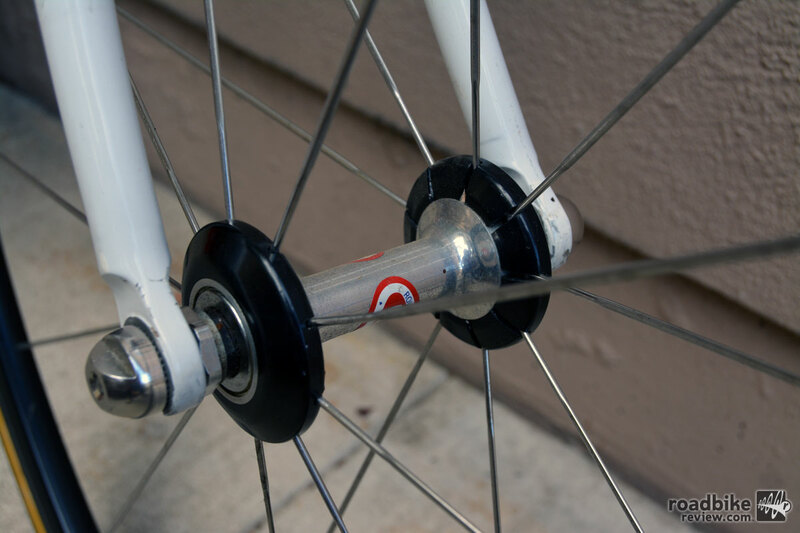 Bikes were almost universally made from steel tubes held together with lugs, the same way things had been done for decade. Tube shapes were round and non-aerodynamic. Frame weight was high. The bike that changed it all. But then the Kestrel 4000 all carbon monocoque bicycle frame was introduced for the 1987 season. It truly was a game changer, hearkening a “disruptive” evolution in how bikes were made and what material they were made from. Flash forward to present time and we wanted to see how that transformative bike rides compared to today’s speed machines. 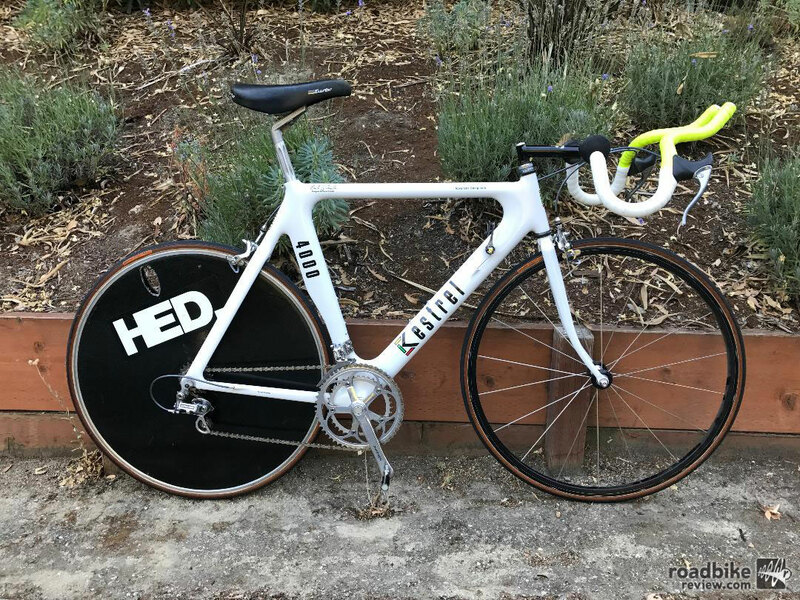 This throwback test bike, an original Kestrel 4000, came to RoadBikeReview by way of a collector who really appreciates the history of innovation with cycling. The owner has put together a nearly mint condition masterpiece that showcases the technology of the time. The frame, handlebars, wheels, and indexed shifting are all the basis of what is state-of-the-art today. The bike is beautiful, and could still be considered a daily driver, miraculous considering it’s over 30 years old. 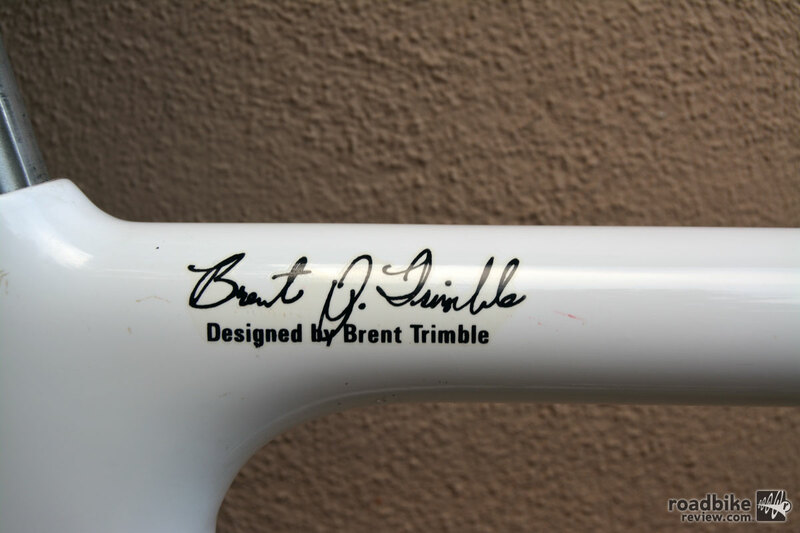 The Kestrel 4000 was the first offering of Cycle Composites Inc. or CCI, which was launched by Trek founder Bevil Hogg and Tom French in order to commercialize Brent Trimble’s designs. It was also the world’s first full carbon fiber production bike. Other carbon bikes existed, but they used round tubes and lugs, merely iterating on the existing steel tube and lugged construction. 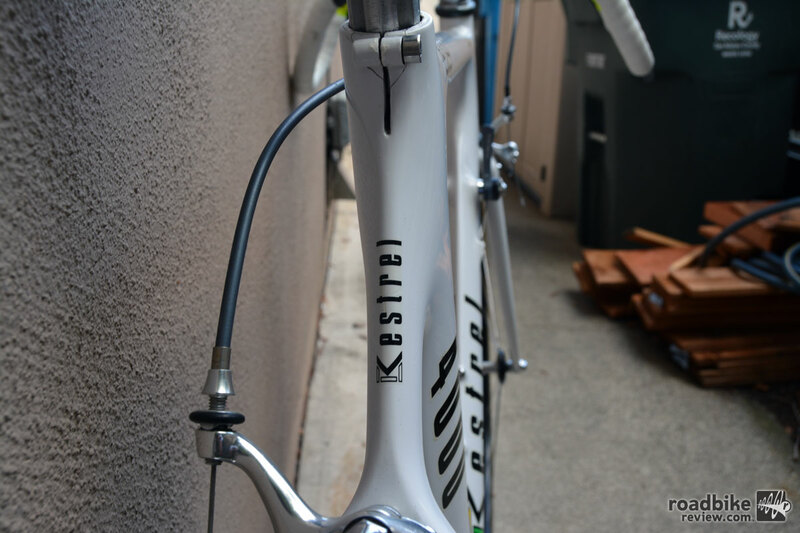 The Kestrel was the first bike to use carbon throughout, joints included. 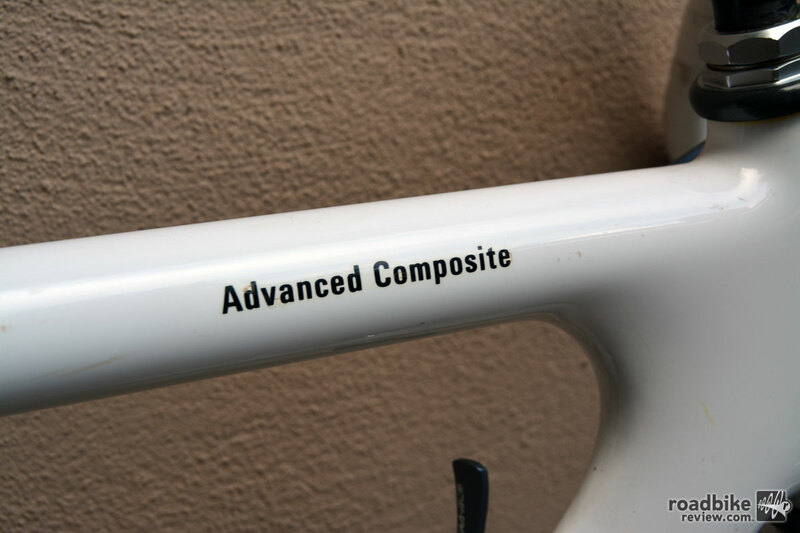 It featured a revolutionary monocoque frame (meaning a molded single piece), aerodynamic shaping, and internal cable routing. Incredibly the frame was nearly 40% lighter than typical steel frames, coming in just over 1600 grams, which was unheard of for its day. HED Rear Wheel: HED made the first mass-produced tubular disc wheel that featured structural solid material between the hub and rim. Undeniably faster, they also make a distinctive “thump thump” sound under acceleration. 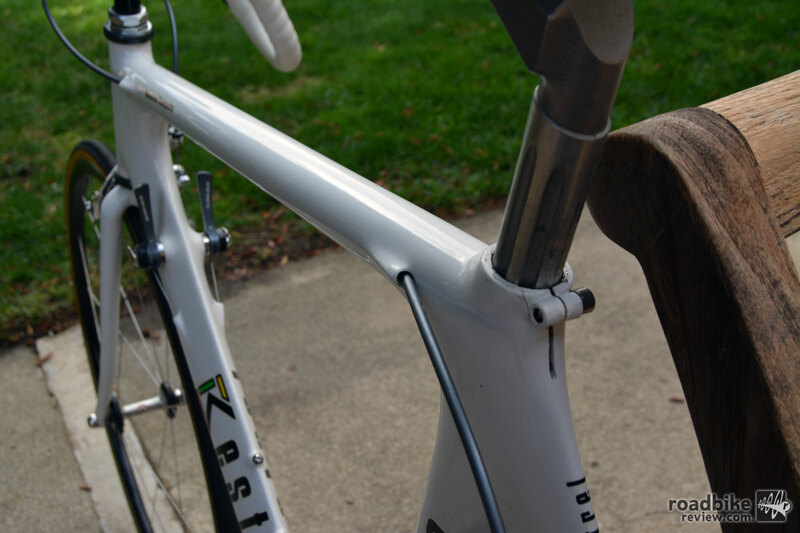 The stem is 150mm in length, the longest stock length available at the time. 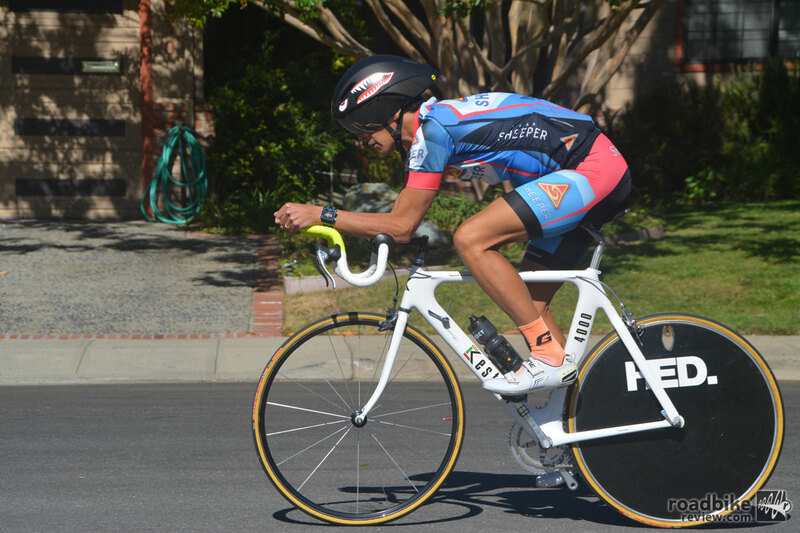 After getting fitted, I was surprised at how comfortable and stable the bike felt. The SIS shifting was absolutely precise, though reaching down to the down tube to shift disrupted smooth TT cycling efforts. The front wheel was remarkable. Heading out on a windy straight road, the front end had no twitchiness despite the strong crosswinds I encountered. The frame felt solid and there is no noticeable flex even under hard acceleration. I even clocked my second best Strava time for one rolling uphill segment of my favorite TT course that I have done countless times. 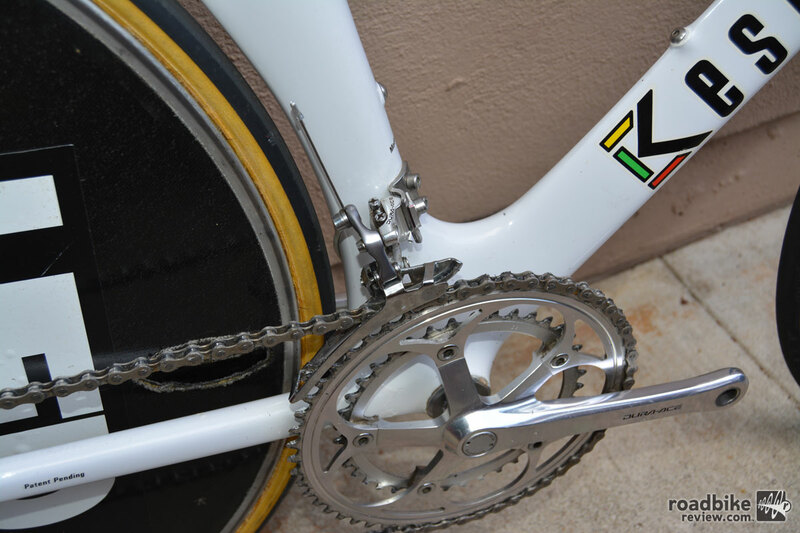 This bike features first generation SIS indexed shifting with Dura-Ace components which gained adoption in 1986. 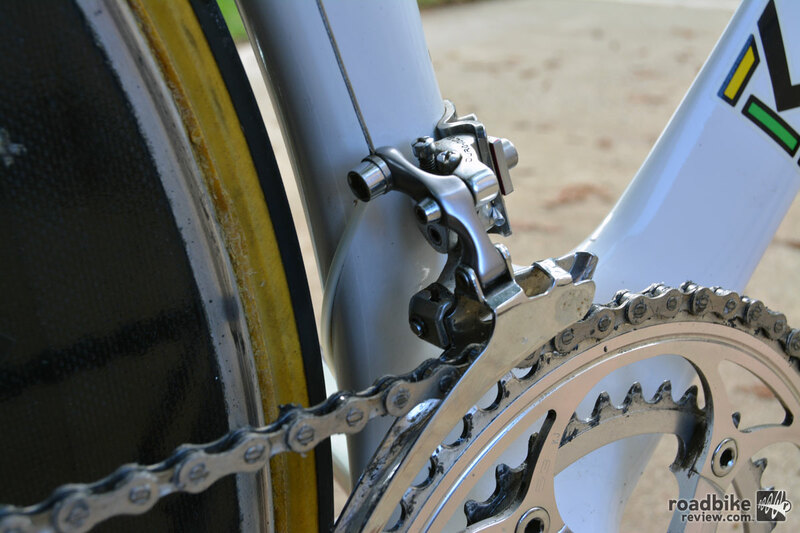 Prior to SIS, shifters all used less-precise friction shifting to move derailleurs from gear to gear. 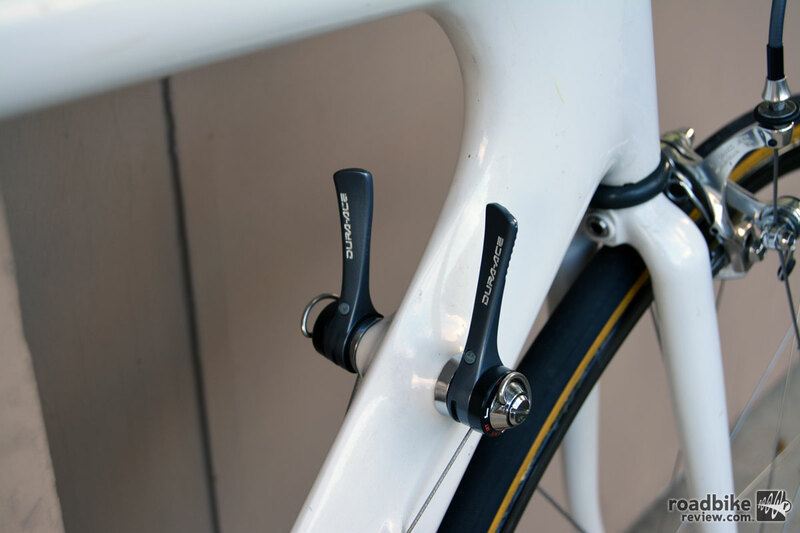 Indexed shifting allowed the shifters to snap in to place more precisely. However, road feedback was a bit dull and wooden, which is understandable since this was such an early design/experiment with carbon fiber. There isn’t a lot of tactile feedback from the road surface. The low and long stem had me stretched out past my flexibility limits. Raising the stem helped to alleviate that feeling, though I still would have been more comfortable with a much shorter stem. But on flat roads, the bike rode rock-solid. No wonder it was so popular on the Ironman triathlon circuit back in the day. Braking was a bit problematic, as the rear wheel had some play, requiring brakes to be set wide so the wheel doesn’t rub – but that doesn’t mean the brakes aren’t effective. 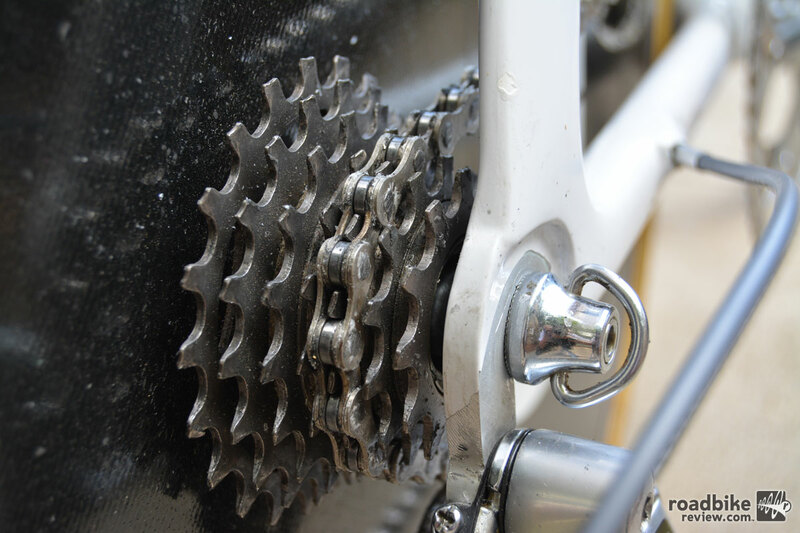 The gearing was also too low for me; I’ve grown accustomed to rear gearing of 11-26 and the 12-21 that it had made it harder to keep cadence up, requiring a downshift to the small ring, especially on rolling hills. Scott DH Aerobars: the first mainstream aerobars, patented in 1987 and made famous by Greg LeMond’s 8-second win at the 1989 Tour de France. Triathletes embraced these eagerly in 1987. All that said, this bike was truly revolutionary back in the day — and is still impressive today. It set the stage for what could be done with the miracle material that is carbon fiber. 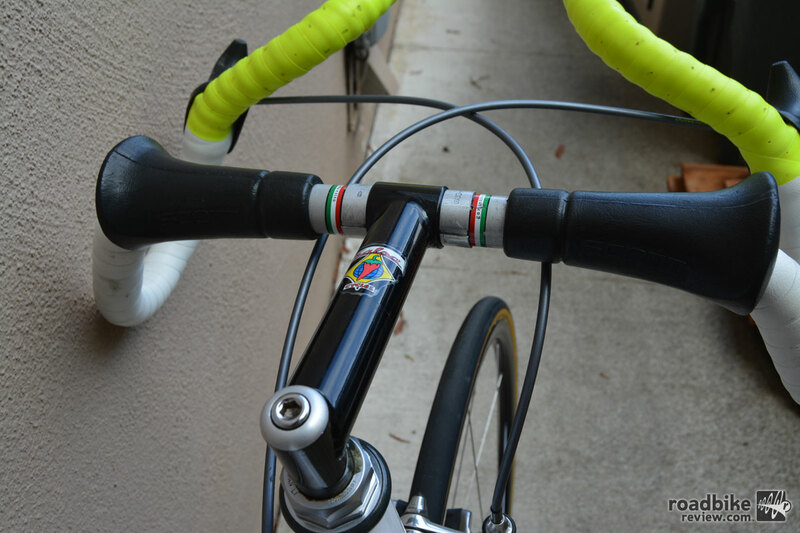 The light weight, aerodynamic tubing, and internally routed cables were far ahead of the time. It was a pleasure to ride this bit of cycling history. For more information, check out this Kestrel tech talk and see what Kestrel is up to now. 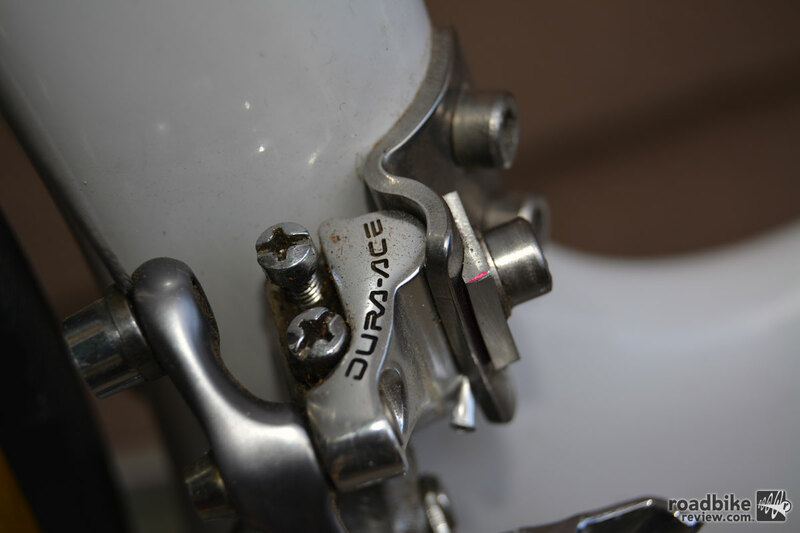 Shimano Dura Ace 7402 with a 6-speed 11-21 cassette, 53/39 chainrings, and 175mm crank length. 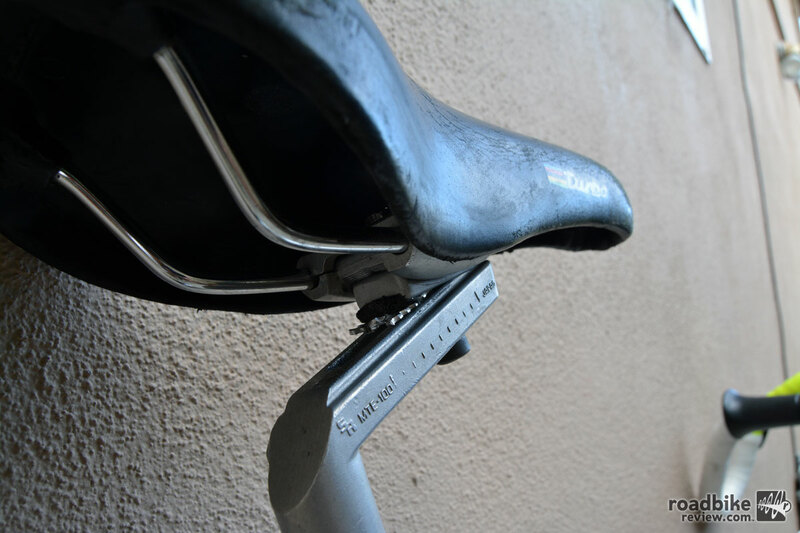 To get triathletes in a more forward position (moving the seat angle from a slacker 72-73 degrees to 78-80), bikes in the early aerobar era were often fit with seatposts mounted 180 degrees around, effectively moving the rider over the pedals instead of behind them. Thanks for the walk down memory lane. That bike was an amazing an unheard of piece of kit back then. 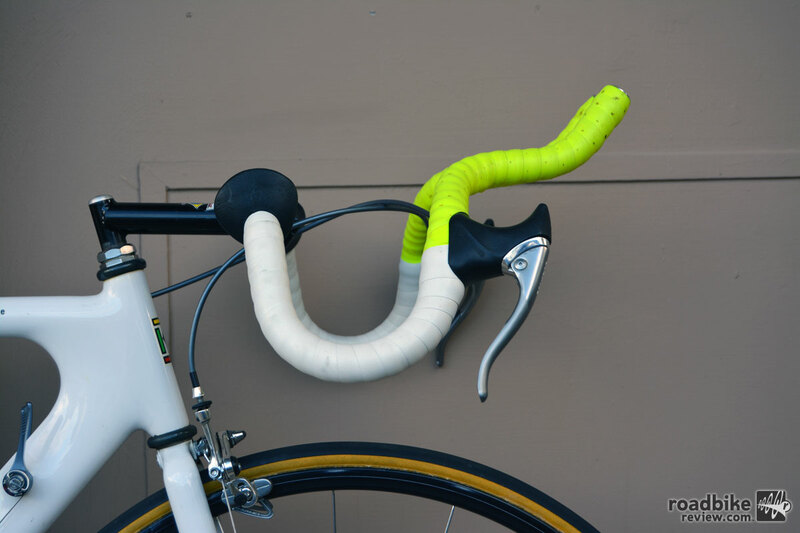 Small correction, lemond won with a version of the Scott clip on bars. 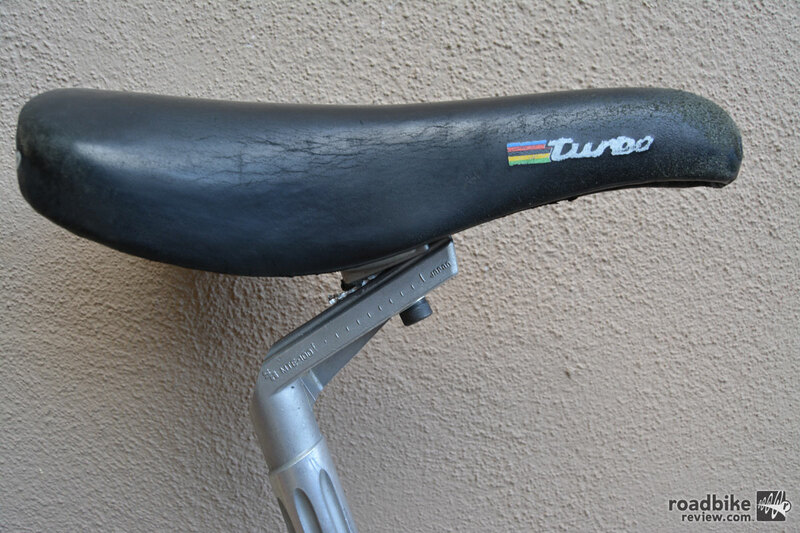 These DH (or death handlebars) where an earlier tri version.